At HPS we inventory a wide range of high-quality pumps and motors of all types and models from the world’s leading designers and manufacturers. Danfoss orbital motor range is the broadest on the market – and your safest bet for quality, durability, efficiency and reliability. Their motors have set the market standard since the beginning. These motors are suitable for closed and open loop hydraulic circuits for work and propel systems, our Orbital motors are ideal for agricultural, road building, construction, forestry, public utility and lawn and garden equipment. Denison piston pumps, vane pumps and motors are ideal for mobile industrial and truck applications. Whether you need open and closed circuit pumps and motors for hydrostatic transmissions, fixed- and variable displacement or load sensing bent axis motors, radial piston type for mobile hydraulics or low speed, high torque radial motors for heavy industry, Denison manufactures it. Oilgear manufactures MFW and MVW fixed and variable displacement bi-directional high speed motors in two frame sizes and four displacements, allowing for greater flexibility to match pressure and capacity. It also produces some of the most robust variable and displaced axial piston pumps in the world. Advanced hydrodynamic bearing design delivers superior system performance and these pumps work at up to 650 bar with volumetric returns of up to 98%. Bucher’s high pressure internal, external and metering pumps have proven themselves in 30 years of service around the world. 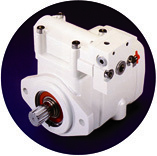 A standout feature of their hydraulic pumps is low noise, long service and durability. Casappa engineers a wide range of piston pumps with many functions, such as valves and control, directly incorporated to optimize system space and costs. If you need a fixed or variabable displacement axial piston pump with SAE, DIN, and European standards, Casappa has the expertise to deliver. Hydra-Power Systems stock and distributes the following Casappa products: Fixed and Variable-displacement piston pumps. Dynaset is the global leading manufacturer of hydraulic generators, power washers and compressors. Dynaset hydraulic equipment converts the mobile machine’s hydraulic power into electricity, high pressure water, compressed air, magnet and vibration. Dynaset’s products are used for hundreds of applications in various industries all around the world.